Friday afternoon, my Grandma passed away. She has been pretty ill for some time, so it wasn’t a complete shock, but you’re never prepared for the quick downhill turn someone can take. I missed a chance to see her by just a day (I was planning on heading out there with my brother Saturday morning). Most of my extended family only lives 4 hours away, in the town I grew up in, but it may as well be 40 or 400. I’ve got some guilt over the fact that I always meant to make time to see everyone, but never think about what happens when the time runs out. I’ve been doing a lot of thinking about my family this weekend. I’ve been swamped with work – a job that the security of which is in limbo and the environment of which is rather demoralizing. My classes have me busy every single evening and weekend. House projects never end. I’m trying to make working out every day a priority but when I don’t I feel so guilty. Attempting to have a social life seems to mean I coordinate everything and stress myself out to the point it’s not even that fun. I have a never-ending, and disproportionately self-induced to-do list. I have an unofficial Dear Abby title that has me listening to and helping out other people constantly.. people who will never be around if/when I needed them (I’ve always let this happen). My calendar is full, my wheels spin constantly, and I am sleep deprived. I am not complaining that my life is hard. It’s not. This is life. It’s chaotic. And then you lose someone, or more accurately, your whole family loses someone, and you realize it’s time to slow down. To shift some priorities a little bit and focus more on things that matter, like being a better wife, daughter, sister, and friend to the people who I truly mean to, and want to, make time for. I just wanted to write a little bit about my memories of my grandma somewhere. She was so sweet. She was quiet and patient and never wanted the limelight. She had a hard life I’m ashamed to know I don’t know more about. She raised seven kids, of which my mom was the oldest. She would knit the most beautiful things and loved to read – having the unlikely affinity for the horror genre. She loved hearing about her grand kids. When I was little, she would pass around the letters and pictures my cousins would send so we could all see how they were doing, too. She was so proud of all of us. She tried to teach me how to shuffle and deal cards once but I was really bad at it. 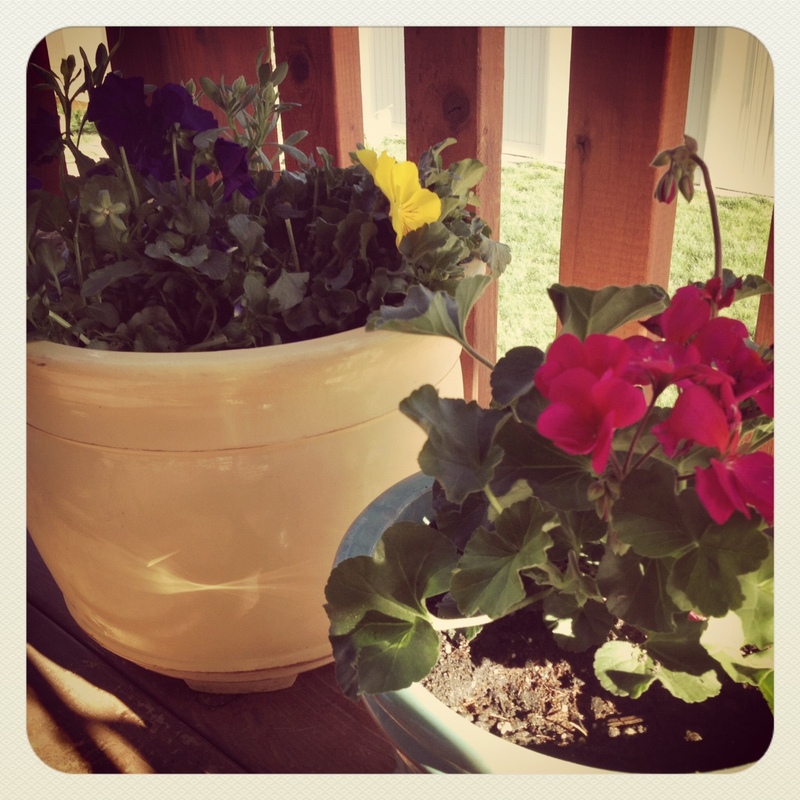 Yesterday I planted some pretty flowers in some pots outside and thought about my grandma. A really silly tribute but it somehow felt important because I know she’d think they are beautiful. RIP, Grandma. You will be missed by all of us. I’m so sorry for your loss, Kellie. The beautiful flowers and time spent pondering are a lovely tribute to her. I’m sure she would be pleased. I think the flowers were a great idea. You’re grandma was always so kind and such a cute lady. I am very lucky that I got a chance to meet her. She will be greatly missed by many. I’m sorry for you loss, lady. It’s not easy no matter what the circumstances. Thanks, Terra. So true. Appreciate the comment. So sorry for your loss Kellie. Losing someone is never easy, sounds like she was a wonderful lady. Thank you, Tash, she was indeed.